GENE SEZ: "Clarence White's musical ideas created the need for a B-Bender and being raised in my Dad's machine shop gave me the skills to figure out how to meet that need. Clarence was exploring the musical possibilities of bending notes on a Telecaster. Late in 1965 Clarence and I were playing on a lot of recording sessions together. We had finished the basic tracks on a tune, maybe a Rex and Vern Gosdin track. Clarence was ready to put the lead guitar track on when he realized he needed three hands for the lick he had in mind." "One of Clarence's innovative guitar techniques was to chime the high E or B string and bend it up a full tone by pulling the string down above the nut. This worked great in open position but on this particular tune he wanted to play the lick up the neck. He needed another hand to do it. I provided the third hand on that occasion. It was a great sounding lick although having both of us play one guitar wasn't going to work for live performances. We were both intrigued by the musical possibilities of having a third hand to play guitar." "I knew there had to be a way for Clarence to bend the string himself. I offered to install pedals and cables like those used on pedal steel guitars. Clarence refused because he wanted something that would fit inside his guitar case." "After a couple of weeks of thinking about it, I came up with the idea of using the shoulder strap to actuate a string-pulling, note-bending mechanism. Not only would it fit into the guitar case, it would actually go inside the guitar! I drew up some plans that incorporated a steel guitar bridge that Sneaky Pete Kleinow procured for me. After a little convincing Clarence bravely agreed to let me install this contraption in his beloved Telecaster. He said, "Just don't show me until it's done." "I wasn't certain at first which strings to pull or drop or whether to affect two strings at once. We tried all kinds of stuff, including using an armrest as well as the shoulder strap, to do all kinds of things to the first four strings. Clarence found that all he really wanted was to be able to bend the B string a whole step using his shoulder strap. He found a whole new world of guitar licks using a B-Bender." Clarence White, Gene Parsons, Gib Guilbeau, and Wayne Moore, were the house band at the Nashville West in El Monte in 1966. Before Gene gave Clarence his Bender equipped Telecaster he had the foresight to record their show one night. The out-of-print Nashville West CD is now considered by Guitar Player Magazine, "One of the top 20 essential country albums of all time." It is a great documentary of Clarence White's innovative guitar artistry. Clarence and Gene joined The Byrds in 1968. 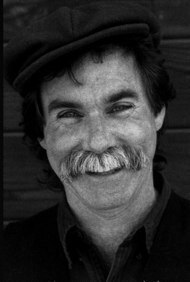 With help from Eddie Tickner who was managing the Byrds, they obtained a patent on their string-bending mechanism. They brought the design to Leo Fender who arranged for Fender/CBS to license the right to manufacture the design. After the new management at Fender let the patent license expire without ever getting the B-Bender into production, Leo left Fender. Clarence White was killed by a drunk driver in 1973. His Telecaster, with the prototype Bender, now belongs to Marty Stuart. A lot of players were inspired by Clarence's B-Bender licks but, except for a few instruments made by Dave Evans, there weren't many B-Benders to be had. The first top ten hit using Bender licks was the Eagles 'Peaceful Easy Feeling' played by Bernie Leadon using an Evans guitar with a Bender. B-Benders first became readily available around 1973 when Gene started making and installing them in customers' guitars in his shop in Caspar, California. In the beginning the device was called the Parsons/White Pull-String. After a number of local folks called Gene to say, "I hear you do upholstering. Will you re-cover my couch?" Gene decided to call his invention StringBender. Although Gene has upgraded the design for ease of manufacturing and installation the basic geometry has stayed the same. Gene says, "I experimented with smaller, less complicated mechanisms that would entail less routing. I found that in order for the StringBender to work smoothly, evenly, stay in tune, and have an extremely musical action, a large bearing surface and return spring were required." The first 112 Benders had serial numbers. The customer list of the first 112 B-Bender owners includes some of the finest players of all time. The first B-Bender guitars from a major manufacturer were from Tokai Gakki. Tokai made a couple hundred guitars incorporating B-Benders that Gene made in his shop. Later, under different management, Tokai tried marketing, without success, a device of their own design that bent three strings at once and was available in a paisley Tele-style. GENE SEZ: "For almost twenty years I made StringBenders by hand in my shop, installing them for guitarists who learned about them by word of mouth. In 1989 it came time to quit or get serious. I tried quitting. 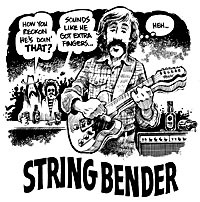 But news got out that I wasn't going to make StringBenders any more (Frets magazine mentioned the end of B-Benders in their Notes section) and every guitarist who had ever intended to get a StringBender 'someday' called to ask me to make one more. Suddenly I had more orders than I could make or install myself." "StringBenders came full circle when the Fender Custom Shop began offering B-Benders	as an option. Fred Stuart, a Master Builder at Fender Custom Shop who has "Telecaster" tattooed on his arm, came up with the notion of a Clarence White Signature Telecaster incorporating a Classic B-Bender. The enthusiastic response from Telecaster players exceeded Fender and StringBenders wildest expectations. Leo Fender's original vision, to have B-Benders available on Fender Telecasters, came to pass in 1996 with the introduction of the Parsons/Green Fender B-Bender."